The 1950s were a pivotal time for the American Automobile Industry. The post-World War II era brought consumerism to a new level; America was enthusiastic, happy with an eye on the Future. Competition was stiff between the automakers; the industry was maturing in an era of technological changes, innovative design and greater profits. By the end of the decade, the industry had reshaped itself into the Big Three: General Motors, Ford, and Chrysler. The age of the small independent automakers was coming to an end, as most of them either joined-forces or went out of business. The 1950's were the Pinnacle of American automotive manufacturing and helped shape the United States into a superpower. 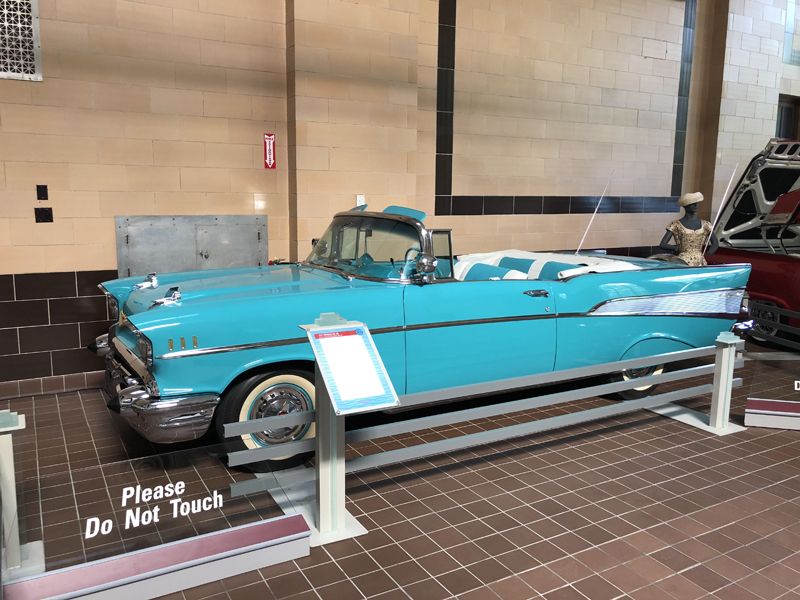 Visit the Museum and experience the innovations, design styling and culture of the 1950s Automobile Industry. Some of the highlights are a 1959 Imperial Crown, 1954 Buick Roadmaster, 1958 Bonneville Convertible, 1954 Kaiser Manhattan and more. 1949 HUDSON BROUGHAM SUPER SIX On loan courtesy of Don Rancatti, Williamstown, MA. Known as much for its success in early NASCAR racing as for its unique design, this Hudson Brougham Super Six was one of 91,337 produced. And while it is officially a ’49, it is exactly the same as a ’50 and helped set the tone for an exciting decade of automotive developments and styling updates. “It’s powered by a 308 cid six-cylinder flathead 7X motor,” relates its proud owner. “The 7X was the racing version available with factory provided accessories that were installed by dealers. “The combination of a low center of gravity and the 7X motor propelled Hudson to dominance in NASCAR. The currently installed engine was built by the late Bill Albright and has high compression, headers and three carburetors. The intake manifold was built by Bill. I was told he raced this setup in California. The Hudson is not a standout in performance by today’s standards, but in its day it was a formidable contender.” Following the close of WW II, America’s automobile manufacturers scrambled to resume peacetime production but initially faced supply shortages and labor disputes. In order to meet the pent-up demand for new cars, existing prewar automobile designs were put back into production with few, if any, updates. In the background, though, the race was on to become the first American manufacturer to hit the market with fresh new designs. Hudson was one of the first with its innovative new “Step-Down” models that truly revolutionized automotive design. Hudson’s “Step-Down” concept represented a major rethink by moving away from traditional body-on-frame construction, which forced occupants to step up and into their vehicles. Instead, Hudson engineers placed the floors down inside the chassis. A sturdy perimeter frame encircled the passenger compartment and rear wheels, and Hudson bodies used rigid, semi-unitized construction. In addition to providing remarkable ease of entry and exit, the lower center of gravity greatly improved cornering ability both on the highway and the race track. The “step-down” design also allowed Hudson to gain weight savings provided through unibody construction. The cars featured slab-sided bodies with fully integrated fenders. Brougham and sedans were fastbacks while convertibles and coupes were notchbacks. A character line ran from the front to back further lowering the car even more visually, so "the new Hudson looked like a dream car straight from the auto show,” according to one journalist. Originally unveiled in December 1947, the new Hudsons made a big splash with the public and proved highly influential on the industry. General Motors was reputed to have purchased a number of them for evaluation, with the cars used for several years as a standard for handling and performance. While Hudson did not enjoy the virtually unlimited capital of some of its larger competitors, Hudson still managed to launch new models through 1954, when the fiercely independent company ultimately merged with Nash to form American Motors. With its factory-style two-tone paint job, this particular Hudson takes one back to the start of a glorious era. A perfect example of the excesses of the 1950’s that marked America’s emergence from a war to a consumer economy, this low mileage beauty still has the original interior and paint Detroit put on her back in 1959. “She's not perfect, with a few bumps and bruises and some of the chrome isn't quite as shiny as it used to be, but she runs well and is a lot of fun to show off,” says Beauchain, who purchased the Imperial to satisfy his lifelong craving for a “big fin car from the 50’s.” Powered by Chrysler's new 413-cu.in. "Wedge" V-8, a lighter and stronger replacement for the previous 392.7-cu.in. powerplant, the car features a four-barrel carburetor and dual exhaust, yielding ratings of 350 hp at 4,600 rpm and 475-lb.ft. of torque at 2,800 rpm. Power was fed to Chrysler’s TorqueFlite three-speed automatic transmission featuring Chrysler’s familiar dash-mounted pushbutton selector. It also sports Chrysler’s long-standing torsion bar-front/leaf spring-rear suspension, Constant-Control power steering and Total-Contact power drum brakes. Beauchain detailed his love for the vehicle in a Hemmings Classic Car magazine feature, saying "I'm really fascinated with this time, everything of that era--especially the excessiveness of the vehicles. I've always liked big cars. My first car was a 1967 Dodge Polara four-door. A lot of people will say they want the car they had when they were growing up. I don't want that, I want a car from before I was growing up! "In June 2012, I happened upon an ad for a Cadillac for sale near Pittsburgh, Pennsylvania. In the last line of the ad, the seller also stated he had a 1959 Imperial for sale. I emailed him to ask about that car, saying I wanted something that was ready to drive to shows and for family trips to the ice cream stand. As we arrived at the owner's house in Pittsburgh, I saw the Imperial sitting out in the driveway, and it was love at first sight The Crown was Imperial's mid-trim model, with the $5,403 Southampton, Imperial's term for the pillarless hardtop, the most stylish of the line. This particular Imperial was enhanced by the optional black Landau roof treatment and Flight-Sweep faux continental spare on the trunklid and swivel-out front seats and the Imperial Touch-Tuner AM radio with power antenna on the inside. The proud owner aptly summed up his love for the car when he told the Hemmings interviewer "Driving my Imperial is always fun, not only with the attention it attracts, but for a car as large as it is, it runs the curvy Vermont back roads quite well. As for braking, as long as I plan ahead of time, the four-wheel, 12-inch drum brakes work fine to stop this 4,800-pound car. After a few miles, you're apt to see me with my left arm out the window and my right hand on the wheel, just relaxing as I cruise down the road.” Looks and luxury – the 1950’s revisited! All Buick Roadmaster convertibles from the 1950’s are glorious vehicles. But this version is both unusual and extremely rare, as explained by the curator of the Taylor Collection. “This car appears to be a standard 1955 Buick Roadmaster. But in fact, it is a one-off prototype built for one of General Motor’s Motorama shows. These extravaganzas were marketing masterstrokes, high-profile traveling road shows designed to showcase GM’s innovative new models before they actually went into production. “They were virtually hand-built and hugely expensive to fabricate. Most of these special pre-production cars were retained by the company and later destroyed. Only a handful escaped the crusher. This car (BX 279B) is one of those extremely rare survivors that are highly prized by collectors today.” Following WWII, Americans had flocked to showrooms and auto shows in search of new and exciting vehicles. One of General Motor’s most popular marketing tools was the traveling Motorama, which gave consumers a glimpse of the future and an up-close look at their newest, most interesting models. 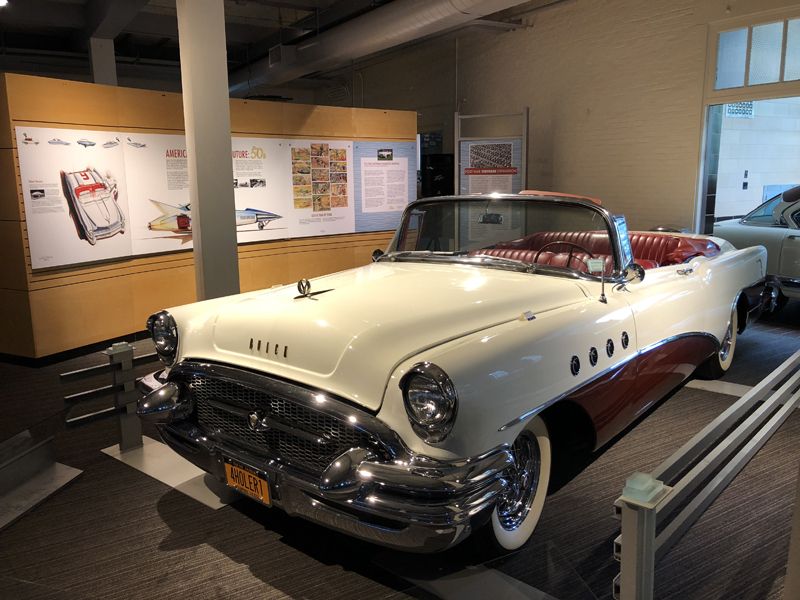 The Roadmaster model made its debut in 1954 along with the 322 CI OHV Fireball V-8 engine which would power full-size Buicks up to 1970. Better known as the “Nailhead,” it replaced the venerable Buick “Straight Eight,” with the combination a major factor in propelling Buick to third (444,609 units) in overall US sales. The Roadmaster, base price $3521, was the second most prolific convertible with some 3305 units sold. Rated at 200 horsepower, the 322 CI powerplant sported an 8:1 compression ratio and a Carter four-barrel carburetor, feeding power to a Dynaflow automatic transmission. Power steering, power windows and power brakes were standard, with popular options including Kelsey-Hayes wire wheels, a power front seat and a radio with electric antenna. The combination of looks and luxury proved to be extremely popular. Those cars and the revisions that followed were beautiful, but none had the appeal of this particular Motorama version, which set hearts aflutter across the nation then and now! 1952 and ’53 Kaiser Manhattans were powered by the “Supersonic Six,” a 226 cid/118 hp straight-six flathead engine originally designed by Continental. For this 1954 version, a supercharger was added, significantly increasing horsepower and offering a valuable marketing tool as well, since in the early 1950’s horsepower was becoming a battleground for manufacturers. The standard transmission on the Kaiser Manhattans was a column shifted three speed Borg Warner unit, while the optional automatic transmission was a four speed Hydra-Matic sourced from General Motors. The 118.5 inch wheelbase cars featured Bendix drum brakes, independent coil spring front suspension and semi-elliptical leaf springs locating a solid axle in the rear. Both front and rear featured tubular hydraulic shocks and Kaisers were noted for their smooth ride. Average delivered price was some $2600. Along with the supercharger, the updates for 1954 included a padded dash, a redesigned grill, Buick-like headlight rims and fin-like taillights that travelled up the fenders. “This car is exactly like the first car my parents owned,” recalls Simione. “My father always worked two jobs, delivering for his family bakery and then working as a waiter at a couple of area restaurants. One of the restaurateurs bought a new Kaiser and, five years later, talked my father into buying it. He had never owned a car, he and my mother having gone places in the bakery van, so the car was both his first car and the first one I drove. “My parents had the car for three years, until someone rear-ended it one day when my mother was driving. A body man who had worked for the dealer that sold it estimated repairs at $500, but since my father had only paid $1000 for it, he decided not to fix it. My mother loved the car and she never forgave him, so when I bought this car and took them both for a ride, it was a great day in our family history!” This vehicle is the perfect illustration of the 1950’s, with styling completely different from cars of the 1940’s to meet the desires of a public ready for change after WW II. Kaiser-Frazer had purchased the patents of the Graham-Paige Co. in 1947 and would produce first the Kaiser-Frazer and then the Kaiser, after Frazer left the company, through the 1955 model year. All told, the company produced some 760,000 vehicles, but after automobile industry veteran Joseph Frazer left the company, the business went into a steady decline under the leadership of industrialist Henry J Kaiser. Fortunately, this car has been restored to its original state to give today’s enthusiasts a look at what could have been. In 1957, Chevrolets were available in the One-Fifty, mid-range Two-Ten and this top of the line Bel Air model. While all are collectible today, the Bel Air became an automotive icon representing both the spirit and the technological and styling advances of the 1950’s. GM initially planned on an entirely new car for 1957, but production delays dictated restyling the 1955-56 design for another year. Changes included a new dashboard, sealed cowl, and the relocation of air ducts to the headlight pods, resulting in the distinctive chrome headlight that helped make the '57 Chevrolet a classic. Fourteen-inch wheels replaced the fifteen-inch wheels from previous years to give the car a lower stance, and a wide grille gave the car an expanded look from the front. Stylists then added tailfins to duplicate the broad look in the rear. Body choices for 1957 included 2 and 4-door sedans and two hardtops – the 2-door Sport Coupe and the 4-door Sport Sedan. Another automotive icon offered by Chevy in ’57 was the Bel Air Nomad wagon with a sloped pillar behind the hardtop door and sliding windows at the rear seat. A very popular convertible was also offered. For 1957 there were four standard engine options, a 235.5 cu in inline 6-cylinder producing 140 hp, a 265 cu in V8 "Turbo-Fire" producing 162 hp and two 283 cu in V8s: a "Turbo-Fire" twin-barrel carburetor producing 185 hp and a "Super "Turbo-Fire" with a four-barrel carburetor developing 220 hp. Another optional engine was offered with two four-barrel carburetors, the legendary "Duntov" cam and solid lifters. This engine produced 270 hp. 1957 was also the first year that Chevrolet offered fuel injection. A 283 cu in engine fitted with solid lifters, the "Duntov" cam and fuel injection was rated at 283 hp, marking the first time a General Motors vehicle achieved 1-hp-per-cu-in in a production vehicle. Other options included the seldom ordered air conditioning, a padded dash, power steering, power brakes and a signal-seeking AM radio and power antenna. Power windows and power seats were also available. More unusual were the "Autronic eye," a device that bolted onto the dashboard and sensed the light from oncoming traffic, dimming the headlights automatically, and the traffic-light viewer, a ribbed plastic visor that was installed just above the speedometer. Because the roof extended so far forward of the driver, it was hard to see overhead traffic lights. The traffic light viewer captured the reflection of overhead traffic lights so that the driver didn't have to lean forward to see past the edge of the roof. While the ’57 would mark the decade and remain an icon forever, Chevrolet was outsold by Ford during the 1957 model year for the first time since 1935. Many attributed the sales shift to Ford to the '57 Chevrolet having tubeless tires, the first car to have them. Many prospective customers did not initially trust the new tubeless design. Regardless of model year sales, this 1957 Bel Air remains one of the most popular automobiles ever built. The 1957 model year was a notable year for Ford Motor Co., as they outsold arch-rival Chevrolet while also producing unique vehicles that caught the eye of car lovers and casual observers alike. Leading the parade was the Skyliner, a huge hit at auto races, fairs and car shows everywhere as enterprising dealers demonstrated how the hardtop roof magically disappeared into the trunk, turning the sedan into a convertible. Originally purchased in 2014 by Jason Tagliaferri’s father John for use as a nice but not perfect “driver” to supplement the two other 1000-point retractables he had restored, this particular vehicle would first receive a basic restoration, then later on a hurried but perfect update to its current award-winning state. The car, sporting the standard 285 hp/312 cid V-8 with automatic transmission, had had been partially redone by previous owners but much of it was rough, as evidenced by the use of an on/off wall switch to operate the retractable top. "The previous owner had removed the engine and transmission and had them rebuilt, but neither were tested," Jason told Hemmings Classic Car magazine. "The newer paint was presentable. When we looked at the underside, the frame and floors were solid, but we saw that patches had been added to the lower quarter panels.” The trim, front fenders, hood, engine, transmission, and the interior were then removed, but the suspension remained bolted to the Ford's frame, as did the main body shell. The body was then sanded to bare metal, repaired, sealed and repainted with Ford's Flame Red and Colonial White factory two-tone color scheme. With electrical switches, motors and limit switches so necessary to the operation of the retractable top clean and ready to go to finish the restoration, the Tagliaferri’s were hit by the shock of John’s diagnosis with a severe heart condition. This caused him to change his outlook and ask his son to give the ‘57 one last showcase restoration before the next International Ford Retractable Club National meet. “I had three months to shift gears and take the car to the next level,” Jason told Hemmings. Since the body was complete, a lift was used to allow access to the chassis and suspension. The underneath was stripped and repainted, the suspension rebuilt and the final challenge tackled. "The wiring was a mess," recalls Jason. "Aside from the household wall switch, someone had redone most of it with cheap yellow wiring, making it a nightmare to trace. The top requires a series of relays, circuit breakers and limit switches, and those limit switches are the key to making the system operate in perfect order and timing. It was a very time consuming repair." But the top eventually worked perfectly, a new interior made the car look like new both inside and out, and the car was judged a 946 point vehicle at the 2015 IFRC Nationals. This Skyliner represents the style of the 1950’s, the mechanical ingenuity of Ford’s engineers and, most importantly, the end result of the Tagliaferri families’ dedication to the automobiles they love. First introduced to a war weary public at the 1948 London Motor Show, the wildly popular XK would be produced through 1954. The 120 designation indicated a top speed of 120 mph, making it the fastest production car at the time. Surprisingly, the first XK built went not to an Englishman but to film star Clark Gable. Before production ended, the XK120 would be offered as an open 2-seater (roadster in the US), a closed or fixed head coupe starting in 1951 and a drophead coupe that made its debut in 1953. All were 102“wheelbase two-seaters and available with left or right hand drive. The first roadsters were hand-built with aluminum bodies on ash framing mounted on a steel chassis using Jaguar Mark V parts. But high demand caused a switch to mass-produced, stamped-steel bodies beginning with the 1950 model year, though aluminum doors, bonnets and boot lids were still used. The dual overhead cam, 3.4 liter inline six cylinder XK engine sported an alloy cylinder head, hemi-spherical combustion chambers, inclined valves and twin side-draft SU carburetors, a much more advanced power plant than found on other cars of the era. With standard 8:1 compression ratio it developed some 160 bhp on 80 octane fuel. Most of the early cars were exported, though a 7:1 low-compression version sold in the UK, where post-war austerity restricted buyers to 70 octane "pool petrol.” All XK120s had independent torsion bar front suspension, semi-elliptic leaf springs in the rear, recirculating ball steering boxes, telescopically adjustable steering column and 12-inch drum brakes noted for fading after heavy use. The roadster's lightweight canvas top and detachable side screens stowed out of sight behind the seats, and its barchetta style doors had no external handles, instead using an interior pull-cord reached through a flap in the side screens. Drophead coupés had a padded, lined canvas top, which folded onto the rear deck behind the seats when retracted, and roll-up windows with opening quarter lights. “I upgraded to radial tires a few years ago and now there is no comparison to its previous handling on the back roads in Saratoga,” offered owner Eric King. “I think I could keep up with a Ferrari Dino now. I purchased the car approximately 8 years ago from Bill Tracy, a noted Jaguar expert. I understand that he restored 12 cars of this model with identical interior and exterior and that this was the last one he did. Thank God he did that last one, because I’ve loved every minute of owning it. It’s what everyone thinks of when you say British sports car!” Factory backed XK’s had reasonable racing success in Europe, with a fifth in the rugged Mille Miglia and a win at Silverstone, while here in America Phil Hill and Don Parkinson ran one/two in the inaugural Pebble Beach Road Race in 1950. And in 1954, Al Kellar made history that remains a popular trivia question today when he became the first driver to win a NASCAR Grand National race in a foreign car. His win in an XK 120 at the Linden, NJ airport on a temporary road course led NASCAR to ban foreign cars until Toyota was allowed to enter NASCAR competition in 2000. 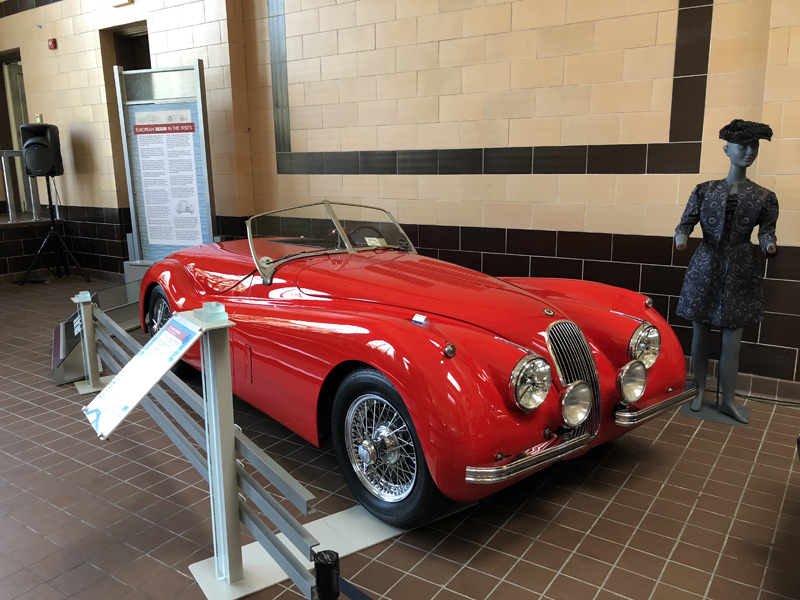 With enthusiasts on both sides of the pond captivated by the car’s performance and styling, the Jaguar XK was every bit as important to 1950’s culture and societal change as more familiar American models. The 1950’s were an era of change and unusual cars aimed at a broad market. While Thunderbirds and Corvettes come immediately to mind, only true enthusiasts are familiar with the Dual-Ghia. Produced in the US between 1956 and 1958, the concept came from Eugene Casaroll, an industrialist who owned Auto Shippers Company and Dual Motors Corporation, which built dual-engine vehicles for the armed forces during WW II. He launched his collaboration with Ghia with a stated goal of “building an exclusive car at a moderate price.” The design was based on four 1954 and 1955 Chrysler concept cars, named the Firearrow II, III, and IV and the Firebomb, all of which were the brainchild of noted designer Virgil Exner. The Dual-Ghia was also produced by the Chrysler design staff, with emphasis on a design that would be “fairly conservative, with single headlamps and slab-sided features, small conservative fins and no styling gimmicks.” The resulting four-place convertible was the only offering. Dodge frames and drive-trains were shipped to Turin, Italy where the bodywork and interior, graced by English leather, were fabricated by the highly regarded Italian coachbuilder Ghia. Once returned to the US, vehicles were fitted with engines and PowerFlite transmission and prepared for sale. Performance was rated excellent due to the cars being powered by the small 315 cu in (5.2 L) Dodge hemispherical-head short-stroke V-8 engine, giving it more horsepower than Corvettes of the day. With a retail price close to $7500, the Dual-Ghia was about $200 more expensive than most American production luxury cars. It cost $200 more than Cadillac's Eldorado Biarritz convertible but was still shy of the ultra-luxurious 1956 Continental Mark II at $10,400 or the 1957 Cadillac Eldorado Brougham at $13,074, meeting the goal stated by Casaroll though in reality most were purchased by rich celebrities. And while repair costs were not a consideration for most of the owners, repairs and any MoPar parts needed were conveniently available at Chrysler dealerships everywhere. Owners included Debbie Reynolds, Lucille Ball, Frank Sinatra, Dean Martin, Richard Nixon and Desi Arnaz. Ronald Reagan also owned one, but he supposedly lost it in a high-stakes poker game with then-President Lyndon B. Johnson, who reportedly kept the car for several years. Of the 117 cars produced, 32 still exist, making this example extremely rare. Its air of sophistication is reinforced by the fact that it was the car driven in the Thin Man TV series by Peter Lawford.